In the United States, “jail” and “prison” refer to separate levels of incarceration. Generally speaking, jails are county or city administrated institutions which house both inmates awaiting trial on the local level and those convicted of misdemeanors serving a term of one year or less. Prisons are state or federal facilities housing convicted felons serving a term of more than one year. Alliance Bail Bonds are pleased to be able to offer you this quick reference resource for information on the County Jails and State Prisons within Arizona. If a friend or loved one has been arrested they will most likely be held at either one of the local city police jails or at one of the Maricopa County Jails. Typically once a person has been charged they will only be held at a local Police Station or City Jail for a few hours (approx 6 hours). After this everybody is transported to the Phoenix Main Jail on 4th avenue. Bail will be set at an initial appearance before a judge and this happens within 12 -24 hrs. If they have not been bailed out by this time they will be moved again and housed at any one of the seven Maricopa County Jails. Once housed, this extends the time it will typically take to be released once bail is posted (approx. 12-24 hours). It is significantly easier and quicker to have somebody released on bail from the local City Jails. Once housed the time to effect release can be days instead of hours. 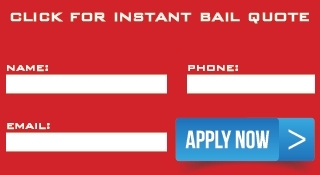 So, to have your friend or loved one released as quickly as possible dont delay and call Alliance Bail Bonds as soon as you can. You can also find information if you know the inmate’s booking number (starts with the letter ‘P’). If you need more help and would like us to help you post bail and arrange for the release of your friend or loved one just give us a call and we will get the process started. The Fourth Avenue Jail opened in April 2005. This state of the art facility is considered to be one of the most secure and technologically advanced facilities in the nation. This facility was part of the largest county jail expansion project in the history of the nation, supported overwhelmingly by the taxpayers of Maricopa County. The Durango Jail was built in 1976 as a minimum security jail. The Durango Jail houses approximately 2214 inmates in seven housing units and two barracks buildings. Each housing unit contains four “pods,” and each pod contains a general-purpose day room area with metal tables and stools, and a bathroom area with sinks, toilets and showers. There are two large outside areas for recreation. The Estrella Jail has a fully staffed and equipped medical clinic, a non-denominational chapel area for religious services, and three education classrooms where inmates can attend educational, drug rehabilitation, or life-skills classes. The First Avenue Jail was built in 1962 and was the first “modern” jail in the Valley, intended to house an average of 500 inmates in a “traditional” jail environment. This jail was closed in 1999 and does not currently house inmates. In 2000, Sheriff Arpaio converted some areas to house animals abused animals. Any animal removed from an owner for criminal neglect or abuse by the Animal Crimes Investigations Unit can be housed at the First Avenue Jail. We now call this the M.A.S.H. Unit. Tent City was begun in 1993 when Sheriff Joe Arpaio was able to obtain some surplus military tents. 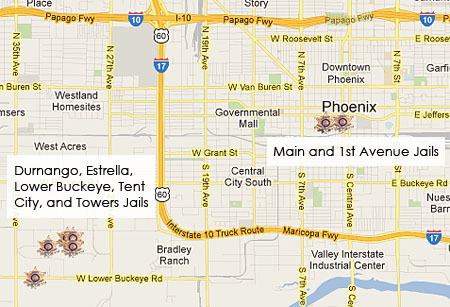 These tents were set up in an area adjacent to one of the existing Maricopa County Jails in Phoenix, Arizona. Sheriff Arpaio had previously decided that he would not release any inmates due to jail overcrowding, and housing sentenced inmates in the tents seemed a good solution. Funding for the project was minimal, and included the cost for cement necessary for base pads, secure fencing, and electric costs for heating, cooling and lights. The jail currently houses approximatlly 180 inmates who are either involved in the Alpha Drug Program, The Chain Gang,or who are not able to serve their sentences in the Tents Jail for some particular reason.